The Lillian collection has been my favorite by far. I love the glamorous combination of purple and gold, which is inspired by Thai Water Lilies. The Lillian II necklace and earrings will complete this collection for now as I plan to work on a few other designs. I tried to capture the rich color of the amethyst and lilac stones in the photos while finding a setting that showed the detail and texture of the beautiful handmade Naga pendant in the necklace (see this post) and the vintage gold Lucite globes in the earrings . These pieces really are beautiful and will bring many compliments! These are the second pair of earrings in my Lillian collection, inspired by purple and gold Thai water lilies. These match my Lillian II necklace (see the last image and link below), but will certainly make a statement of their own! 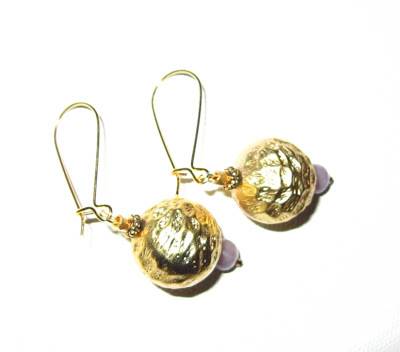 These earrings feature vintage gold Lucite globes (that look wonderful in any light), lilac stone beads, TierraCast gold plated pewter Turkish beads, and faceted beads heavily plated with 22-karat gold. Two Delica® silver-lined chocolate glass seed beads grace the end of each earring. These statement-making earrings hang from gold plated brass kidney wires and are approximately 2 1/8" long and 1/2" at their widest point. These earrings are dramatic, but lightweight. They are limited edition, as the golden Lucite balls are vintage. Two pairs sold at my line launch and I've heard that they draw many compliments! Buy the Lillian II Earrings on Etsy! Read about the matching necklace here. Buy the necklace here.